CRAZY CRAZY FUN | A Rainbow of Colors make these 18" Round Rug Mats FUN, QUIRKY & VERSATILE. •Great for the classroom in schools and daycare, story time anywhere. •Soft and Vivid colors can be used to teach your child colors and much more. 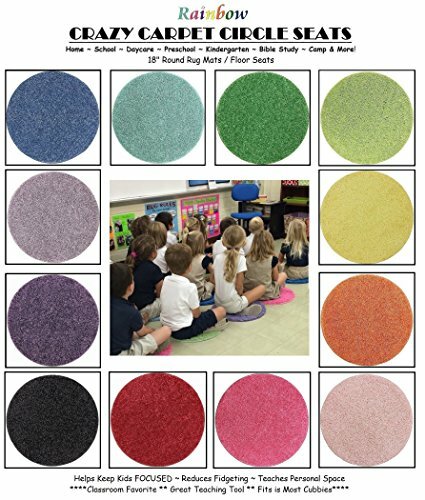 •Use these soft Carpet circle seats to sit on the Floor, sand, grass and benches. Protect your pants while giving you a much softer seat. •These are a must have for any basement playroom with cold floors. The Reviews Are in: Making our CHILDREN'S CRAZY CARPET CIRCLE SEATS a HIT with People of ALL Ages! **WOW 4 years and still going strong. Crazy Carpet Circle Seats continue to be a huge success, exceeding expectations and still growing in popularity every day. Buyers have included: Mom's and Dad's, Aunts and Uncles, Grandparents, School Teachers, Preschools, Schools, Kindergartens, Daycare's, Bible Studies, Churches, Jewish Day Schools, Boys and Girls Clubs, Camps and Many More. Proven by Teachers to help the kids stay focused, limit fidgeting and sitting still on a Crazy Carpet Circle Seat in their favorite color during Story Time and other classroom group activities. Our most popular set to date is the Bright Multi Set of 6 Seats. New Set Additions include: Secondary Wheel Chart Multi Color Sets of 6, Blue Vibe / Green Limeade Sets of 6, Solar Eclipse Sets of 7, Popsicle set of 5 and Many more! •PHOTOS are as accurate as possible due to flash photography and monitor settings. Proven by Teachers to help the kids stay focused, limit fidgeting and sitting still. 18" Round Soft Warm Carpet Floor Mat - Cushions. Finished Fabric edges. A Rainbow of Colors to choose from. Designed by Children's Choice EXCLUSIVELY for Koeckritz Rugs, Inc. AUTHORIZED RETAILER - 100% Authentic Only from Koeckritz. If you have any questions about this product by Children's Choice, contact us by completing and submitting the form below. If you are looking for a specif part number, please include it with your message.